on Blannahassett Island in downtown Marshall, NC. 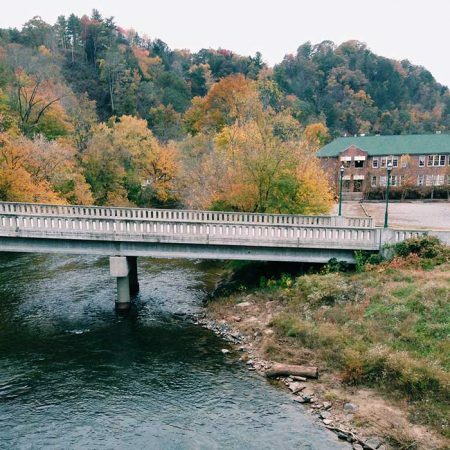 Just half an hour north of Asheville, Marshall is a cozy one-street town that curves around the bend of the French Broad River. Steeped in community, the arts, and renegade mountain living, Marshall is a small capsule into the deep character of Madison county. A place where folk songs lasted centuries and cove communities live root-bound and close to the soil. Nestled atop an island in the middle of the third oldest river in the world, Marshall High studios is a collaborative community of artisans, craftspeople and healers who make their life and art-steeped livelihood here among the river. Build in 1925, the building functioned as the county’s high school for over forty years. Lovingly renovated, with original chalkboards and hardwood charm, today Marshall High is home to twenty-eight studio spaces, a community garden and a park dotted with blue herons and river birches. One Willow’s classroom space is a cozy respite and light-filled library for learning, healing and community togetherness. Come visit us for an upcoming class or contact Asia to schedule an in-person consultations. There is a special magic to this island and we feel so lucky to be sharing it with you. Interested in picking-up medicine? Just send us a line! Lovingly nicknamed “The Island” there is a special magic to this community of creators, ancient waters and river-silt. Fertile dreams seems to take hold here and I am so grateful to have built my healing space here on these shores.